CONTENTS FEATURES 10 MICHAEL ANTHONY’S A Five Star Experience. 14 BIG JIM’S BBQ, BURGERS & PIZZA Specializing in Delicious Southern Dishes. 20 MARGARITAVILLE Kick it Up a Notch. 26 IN THE KITCHEN Donald Hargrove, Executive Chef at Kingfisher Seafood, Pasta and Steak House. 34 BILL ALBERTS of Santa Fe Café. 38 SHAN TAN AND THE OYSTER REEFERS A Parrotpalooza of a Time. 44 THE SOUTH CAROLINA BBQ TRAIL It’s a Southern Thing. 46 WINE AND SEAFOOD PAIRINGS Matching Fresh Fish and Fine Wines. 50 THE EASY WAY TO MORE FRUITS & VEGGIES Health and Fitness Tips from CrossFit Hilton Head. 62 FAMILY FUN On Hilton Head Island and Bluffton. 69 DAUFUSKIE ISLAND Where you Leave your Troubles Behind. PUBLISHER’S NOTE While debating what to write about in my publisher's note for this issue, the usual suspects kept creeping into my head. There are always the summer activities that abound on the Island like heading to the beach, a round of golf, and catching the Tuesday night fireworks, just to name a few. Sure, I thought, that would be the easiest and best information for most of the readers, but after nine years of publishing Taste it seemed that I have been there and done that more than once. Then it hit me. We have now been putting this magazine out for nine years. Nine years! It seems like just yesterday that we put the first issue on the stands and all those memories of what went into starting this publication came flooding back. I have decided that the old adage is true: The older you get, the faster time goes by. I remember sitting in my kitchen making that first set of phone calls to prospective advertisers. As I picked up the phone, I had a gut wrenching revelation; I could be out of business before I get started. What have I done? And then it happened. 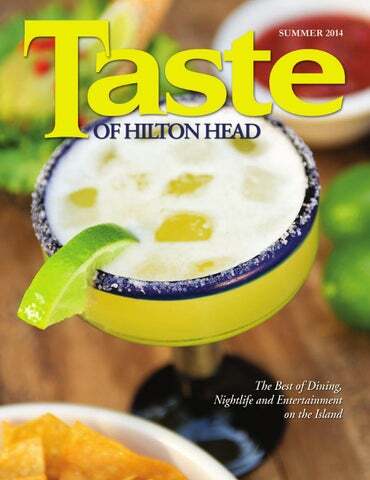 The very first person I reached out to was actually excited about the prospect of a new magazine that would concentrate solely on the food and beverage side of Hilton Head. The positive comments and enthusiasm I received that day were the push I needed to take the leap. With continued positive feedback from some of the biggest players in the restaurant business, Taste took flight. Another very important aspect of the birth of Taste was getting the right supporting cast together to make my vision a reality. The staff at Taste has been another huge key to the success and longevity to date. The majority of that first staff is still with the magazine today and is a major reason I still have a job. So it’s true. As you get older, time does go by faster. While it seems like yesterday since I stuck my neck out to make Taste of Hilton Head a reality, it has been nine years since we first went to press. To all of the people who have supported this publication, whether you’re a reader, an advertiser, a staff member or a distributer, I want to thank you and hope that another nine years goes by just as fast. A LOWCOUNTRY BACKYARD Located at 32 Palmetto Bay Road in the Village Exchange. Capture the true essence of the island while enjoying local and regional inspired cuisine featuring owner Dave and Raina Peck’s family recipes. Choose from Potato chip meatloaf, Charleston fried green tomato sandwich, shrimp & grits, the Bischick and a wide selection of other lowcountry favorites. Dine in or outside in the comfortable backyard. Experience the island, love the food! Serving Lunch 11 a.m. - 3 p.m., and Dinner 4:30 - 9 p.m., Monday - Saturday and Brunch on Saturday 8 - 11 a.m. and Sunday 8 a.m. 2 p.m. Call (843) 785-YARD (9273) or visit us online at www.hhbackyard.com. AMIGO’S CAFÉ Y CANTINA The original Amigo’s is located at 70 Pope Avenue in the Circle Center. Quick, casual and healthy Mexican food prepared fresh daily. Featuring the best burrito outside of Baja, quesadillas, tacos, amazing BBQ chicken salad, Jimmy’s World Famous Margaritas and ice cold beer. This local favorite has been serving islanders and visitors for over 19 years. Dine in or take-out available. Open for lunch and dinner, Monday thru Saturday from 11 a.m. until 9 p.m. Call (843) 785-TACO (8226) or online at www.amigoshhi.com. AUNT CHILADAS EASY STREET CAFE Located at 69 Pope Avenue. Enjoy fantastic food and good times with your friends. Featuring the best Steaks on the Island, Authentic Mexican fare, Momma Reilleys famous Italian cuisine, all-you-can eat Crab Legs and much more. Full bar with daily happy hour and kid’s menu available. Serving lunch and dinner daily from 11:30 a.m. Call (843) 785-7700. Located at the corner of Arrow and Target Road. The Island’s best southern food featuring main dishes such as Buttermilk Fried Catfish, Shrimp and Grits, Mama’s Fried Chicken, Meatloaf and Gravy and many more. Great sides, soups, salads and homemade desserts round out the menu. Full bar, cold beer and a nice wine selection. Open Monday thru Saturday from 11 a.m. until 9 p.m. Call (843) 341- 2664. Located upstairs in Coligny Plaza, Oceanside. A 1940’s themed restaurant with reasonable prices and huge portions. Our extensive menu features steaks, ribs, seafood, pasta, burgers, salads, sandwiches, pizza and more. Great early bird specials from 4 p.m. to 6 p.m. Also, check out our 2 for Tuesday specials. Fantastic kid’s menu available. Enjoy popcorn on the house with your favorite beverage from our full bar. Serving lunch from 11:30 a.m. until 4 p.m. and dinner from 3:30 until 10 p.m., Monday thru Saturday. Call (843) 686-3443. Located at 51 New Orleans Rd., just off the Sea Pines circle. Sleek contemporary style restaurant offering Chinese, Japanese, and Thai cuisine as well as a nice selection of dim sum choices. A sushi bar, traditional bar and an all-you-caneat buffet (lunch only) highlight this magnificent Asian fusion location. Happy hour nightly from 5 until 8 p.m. and carry out is also available. Serving continuously from 11 a.m. until 10 p.m. daily. Call (843) 686-9888.
where mexican Fare meets american Flair ! dining cooking techqniues to redefine your expectations of what flavors can be delivered on a tortilla. The food menu is just the beginning, with just as much emphasis being placed on the mixology mindset behind their bar menu, featuring craft cocktails using fresh squeezed juices, house infused simple syrups, artisanal spiced salts and a list of over 40 kinds of premium tequilas that are sure to excite and might make you exclaim, holy tequila! “Our focus is the same as it has always been; captivating our guests through unique dining experiences that start with superior quality food, delivered at a value driven pricepoint, coupled with a fun and casual ambiance that pays homage to the origin of the cuisine. By doing this, we aim to create a destination that will absorb our guests in all the best ways and make them feel as if they have escaped to a seaside taqueria in Mexico," Bergelt added. For more information visit facebook.com/holytequila or call them at 843-681-TACO (8226). BRITISH OPEN PUB Located in The Village at Wexford and Sheridan Park in Bluffton. Authentic English fare served in an attractive pub-style atmosphere with golf art, memorabilia, and the only bar by Titleist. Great nightly specials including BBQ Baby Back Ribs, Prime Rib, Live Lobster, Fish and Chips, 1/2 lb. Angus Burgers, Lobster Pot Pie and more. Full bar, extensive wine list and beers, ales and stouts from around the world. Kid’s menu available. Serving daily from 11 a.m. until 10 p.m., Saturday and Sunday Brunch 9 a.m. until 2 p.m. Call Hilton Head (843) 6866736 or Bluffton 815-6736. CAPTAIN JOHN’S GALLEY AT THE SALTY DOG CAFE Located at South Beach Marina in Sea Pines. Enjoy seafood right out of the ocean and onto your plate while overlooking beautiful Braddock’s Cove. The legendary captain serves up fresh seafood, steaks, pasta and more in this fun, nautical atmosphere. Early bird dining special, 10% off from 5 until 6:30 p.m. Full bar and kid’s menu available. Call (843) 671-CAFE (2233) for seasonal hours. CAPTAIN WOODY’S All New Location at 6 Target Road on Hilton Head and in Bluffton at the Calhoun Street Promenade. A local favorite for 30 years! Great seafood and more in a casual and comfortable atmosphere. Serving a wide variety of fresh seafood, great signature sandwiches (Grouper melt & PoBoy’s), soups and salads all at affordable prices. Fantastic outdoor deck and bar. Open daily from 11 a.m. til 10 p.m., bar until late. Call (843) 785-2400 or 757-6222 or online at www.captainwoodys.com. CATCH 22 FRESH SEAFOOD & GRILL Located at 37 New Orleans Road in Orleans Plaza. Serving the freshest and best seafood along with USDA prime steaks, pasta, chops and the best bone-in filet. Fantastic specials and delicious menu choices make us a favorite with locals and visitors alike. For Early Bird specials call for hours and reservations. Happy Hour from 5 to 6:30 p.m. daily. Open daily for dinner from 5 p.m. Call (843) 785-6261. Located at 8 New Orleans Rd., just off Hwy. 278. The only restaurant on the Island that writes its entire menu daily based on the freshest local seafood available. Our epicurean dinner menu offers an array of Fresh Fish, Rack of Lamb, Filet Mignon and many other delights. Our wine list, The Best of Wine Spectator “Award of Excellence”, offering half off all bottles of wine under $100 on Monday nights. Serving dinner Monday thru Saturday from 5:30 p.m. and lunch Monday thru Friday from 11:30 a.m. until 2 p.m. Semi-private parties are accepted. Call (843) 785-9277 for reservations or check us out online at www.charliesgreenstar.com. Located at the end of the boardwalk at Hilton Head Resort, mile marker 7 or on the beach at beach marker 94A Singleton Beach. Just steps from the beach with a spectacular ocean view. Coco’s is an authentic beach bar and grill with a casual friendly atmosphere; your place for island enjoyment. Unwind ocean side in the Carolina sun with one of the largest selectons of Beer, Rum, Tequila and the best Margarita’s on the Island. Coco’s grill menu offers something for the entire family. Live entertainment Friday’s 6-9 p.m. Visit Cocosonthebeach.com or become a fan of Coco’s on Facebook. Call (843) 842-2626 (COCO) for seasonal hours, directions and information. THE CHART HOUSE (Formally Charley’s Crab) Located at Two Hudson Rd., just off Squire Pope Rd. Serving up sensational food prepared by Executive Chef Eric Seaglund, accompanied by spectacular waterviews of the Intracoastal waterway and extraordinary service. The expansive menu features fresh fish, pristine seafood, succulent steaks, Lowcountry specialties and an extensive collection of fine wines and decadent desserts. Relax on the expanded contemporary patio. Open for lunch and dinner daily, as well as Sunday Brunch. Happy hour offered daily from 4 until 8 p.m. Call (843) 342-9066 or online at www.chart-house.com. Reservations are recommended. tacos and always sellout. There is a large outdoor upper deck, the perfect place to relax while enjoying a delicious meal with exceptional live music. From reggae to acoustic rock, live entertainment is always on tap at The Big Bamboo Cafe. The best artists from the Lowcountry & beyond perform at 'The Boo' as it is affectionately known as by the locals. Join us for lunch, dinner, late night or our fabulous happy hour at the bar with assorted $3 drink and appetizer specials. For more information visit bigbamboocafe.com or call (843) 686-3443. CRAZY CRAB There are two great waterfront locations- one in Harbour Town in Sea Pines and the other on Hwy. 278 overlooking Jarvis Creek. Fresh local seafood served any way you like in two picturesque settings. Casual dining and great family fun. A kid’s menu is available and children will be entertained by our onsite playground and the largest saltwater aquarium on Hilton Head (Jarvis Creek Location). Serving lunch and dinner 7 days a week. Call (843) 363-2722 (Harbour Town) or 681-5021 (Jarvis Creek) or visit us online at www.thecrazycrab.com. THE DRYDOCK SEAFOOD GRILL & SPIRITS Located at 21 Office Park Rd. in the Sapelo building. Go where the locals go for fresh seafood, cold drinks and good times. Choose from a wide variety of fresh seafood, signature sandwiches, salads and more in a casual and comfortable atmosphere. Dine inside or enjoy the outdoor deck and bar. Open 7 days for lunch and dinner from 11:30 a.m. Call (843) 842-9775. ELA’S BLU WATER GRILLE Located at One Shelter Cove Lane. Waterfront dining, fresh catch seafood, and prime steaks of the highest quality delight the senses at ELA’s Blu Water Grille. This quaint, unique restaurant offers a pleasantly casual and intimate interior with gorgeous views of Shelter Cove Harbor. The kitchen, supervised by Chef Meagen Mehaffey, makes the most of global resources, putting a modern spin on local island offerings. Our first class wine selection from boutique vineyards compliments each culinary masterpiece. Live entertainment is featured weekly. Serving lunch Sunday thru Friday from 11:30-2:30 and dinner daily from 5 pm. Call us at (843) 785-3030 or visit us online at www.elasgrille.com. FLATBREAD GRILL Located at Coligny Circle oceanside in the Beach Market Center. This upscale casual dining sensation is sure to be a favorite of both visitors and locals. Choose from Neopolitan pizza, fresh pasta, fajitas, steak, salmon, gourmet salads, or hearty sandwiches all cooked in our open hearth oven. Hang out in our friendly lounge and enjoy a nice selection of appetizers and cocktails while viewing your favorite sporting event on our HDTV’s. Open daily from 11:30 a.m. for lunch and dinner. Call (843) 341-2225 or online at www.flatbreadgrillhhi.com. The last time I was asked to write an article on summer cocktails, I ended up sampling frozen concoctions up and down our coastline. I was thanked profusely for "taking one for the team" by Mud, our fearless leader and publisher, but at the time I made a note to self that while I thoroughly enjoyed the delicious drinks, my calorie intake and cash outlay did not add up to a winning formula. I therefore decided to take a more conservative approach to margarita madness and explore the drink's origins and popularity instead of sampling it frozen, on the rocks, with salt and lime, without, with silver tequila, gold tequila, fruity, anise and honey, loaded, simple... So let our education begin. In Spanish, margarita means "daisy" which is a nickname for Margaret. But in North America, I believe the translation is closer to, "Please sir, may I have another?" Like any other drink, the margarita is only as good as its worst ingredient. Fortunately, the basic margarita only has three: tequila, triple sec and lime juice. "Where's the strawberry?" you might be asking. "Can I get extra salt on my rim?" Purists scoff at alterations to the margarita—yes, the harshest sticklers say no salt—but the add-ons are part of the drink's fun factor. In the margarita experimentation game, as long as you use quality ingredients, you are winning. That means no margarita mixes. Variations can be as subtle as swapping one citrus out for another or choosing aged tequila over a blanco. What exactly makes this drink so popular and just how popular is it? Here are some fun facts. The margarita is currently the most ordered drink in bars, representing 18% of all mixed drink sales followed by the martini, rum and coke, and vodka and tonic. On average, Americans consume 185,000 margaritas per hour and 34.9 % of sales are in the south which hints to me that it is a go-to vacation elixir. tequila with a "wonder drug", noting that it is the only type of liquor that is not a depressant. “They just taste so good. They are sweet and salty and tangy. Everyone likes them,” she said. While patrons of San Miguel’s order more margaritas on the rocks than frozen, they still have the choice of plenty of frozen varieties like strawberry, wild-berry, mango, and Caribbean. Mary Anne commented that margarita consumers are of all ages, but the younger ones are more apt to try their different flavored margaritas like the blood orange or the skinny. Daring margarita adventurers can say “Ole!” to their jalapeño margarita which froths over with jalapeño juices and slices. Owner of Santa Fe Cafe, Marshall Sampson, says that their bartenders are kept quite busy building the perfect margarita. "Margaritas are our most popular drink by leaps and bounds. It is ordered by young and old -- there is no age limit. Even people that don't like tequila have a taste for margaritas." Marshall also commented that while it is a nice spring and summer drink, it warms up his patrons year-round. Santa Fe Cafe does not offer the frozen variety as Marshall considers those to be the equivalent of a flavored slushy. Instead, they go the more vintage margarita-route and offer a variety of margaritas on the rocks or straight up utilizing a supply of 20 different tequilas to charge up the cocktails. Santa Fe margarita choices include pomegranate, raspberry, peach, and the Cadillac which features a Grand Marnier floater. Their house margarita has a bit of orange juice in it to tone down the tartness. Regardless of how you like your margarita or how daring you want to be, the key ingredient, really, is fun. So next time you are out on the town, go ahead and order yourself one of these kicky concoctions. Your ho-hum vodka-tonic will still be there tomorrow. pizza, prime rib sandwich, salads, subs, wraps, peel & eat shrimp, calamari and of course fried frog legs. 28 HD TV’s and NTN Trivia are also available as well as a kid’s menu. Open for lunch and dinner daily from 11 a.m. Call (843) 686-FROG (3764) or online at www.frostyfrog.com. HARBOURSIDE BURGERS & BREWS Located in Sea Pines, near wonderful Harbour Town shops, this seasonal open-air café offers a relaxed atmosphere overlooking the Harbour Town Yacht Basin and specializes in tasty refreshments, such as the Sunset Margarita, and light casual fare. Call (843) 842-1444 or online seapines.com/dining. HILTON HEAD BREWING COMPANY Located just off Greenwood Drive in Reilley’s Plaza. South Carolina’s first microbrewery since Prohibition. Serving fresh local seafood, great pizza, burgers, wings, salads and much more. Happy hour daily from 4 until 7 p.m. with nightly drink specials and over 30 TV’s inside and out for all the sports action. Open daily for lunch from 11:30 a.m. until 2 p.m. and dinner starting from 4 p.m. Call (843) 785-3900 or online at www.hhbrewingco.com. traditional Japanese dishes such as grilled fish, chicken and steak, suki yaki, a variety of noodle dishes, tempura, daily specials, plus sushi and sashimi. The very extensive menu includes dozens of appetizers, several kinds of broiled fish, salads and over 20 entrees from which to choose. Three intimate dining rooms, a sushi bar and a cocktail lounge offers something for everyone. Early Bird specials and take-out available. Open for dinner 5:30 until 10:00 p.m., Monday thru Saturday and lunch, 11:30 a.m. until 2 p.m. Monday thru Friday. Call (843) 785-9800 for reservations. HOLY TEQUILA Located in Park Plaza, the Holy Tequila taqueria blends gourmet tacos with American flavors, Mexican street food and tequila in an eclectic atmosphere! Prepare your senses for a fusion of flavors that reaches into the heart of Mexico! Holy Tequila combines an open kitchen with indoor/outdoor dining and a dynamic bar to create a high energy fiesta! We serve gourmet tacos, quesadillas, and smalls plates all under $10, with a full bar offering over 40 kinds of premium tequilas. The cuisine is modern, fun and uninhibited, just like our guests! The restaurant is open 12 p.m. to 11 p.m. daily with happy hour specials from 4-7 p.m. Call us at (843) 681-TACO (8226) or visit us online at www.Facebook.com/HolyTequila! HARD TO FIND, BUT WORTH IT! “So, where do the locals go?” This question is asked countless times a day by visitors looking for the best places to eat, drink and be merry on Hilton Head. Generally off the beaten path and found by word-of-mouth, homegrown favorites offer a place to unwind with good food, cold drinks and an inviting atmosphere. It’s no accident that the DryDock Seafood, Grill & Spirits, tucked away in the Sapelo Building on Office Park Road, has all of these ingredients. HUDSON’S SEAFOOD HOUSE ON THE DOCKS Located on the Intracoastal Waterway off Squire Pope Rd. With 45 years of casual dining experience and spectacular views of the Intracoastal Waterway, Hudson’s is an island icon. Featuring the freshest, local seafood in the area as well as pasta, steaks, chicken and more. Enjoy beer, wine or specialty cocktails in the Oyster Bar or while watching the sunset on the deck bar. Featured on the Food Network and in Bon Appétit. Open daily at 11 a.m. Call (843) 681-2772. HUGO’S Located at 841 William Hilton Parkway at South Island Square. Hugo’s features a truly original and memorable dining experience. For over 30 years, Hugo has served generations of locals & visitors. Hugo’s new location offers tableside flaming desserts to make your dinner the most memorable! Experience Hugo’s Award-Winning Steaks and Seafood. The most expansive & extensive menu available from Lobster, Flounder, Crab Legs, Salmon, Crabcakes, to Ribeyes, Chops, Bourbon BBQ Babyback Ribs & much more. Enjoy wines from Hugo’s climate controlled wine cellar or any cocktail from the full bar! Dinner at Hugo’s 7 nights/ week from 4:30 until close. Call (843) 785-HUGO (4846) or click to HugosHiltonHead.com. elegant atmosphere is the perfect setting to enjoy an evening of world class entertainment enhanced by our innovative southern flavors menu and impeccable service. The Jazz Corner offers a signature martini menu, extensive wine list, full bar and late-night menu. Open nightly from 6 p.m. Reservations are recommended. Call (843) 842-8620 or check us out online at www.thejazzcorner.com. KENNY B’S CAJUN SEAFOOD HUT Located in Circle Center, just off Pope Avenue. Enjoy Creole cuisine with a Low country influence. Find an appealing choice of Cajun fare such as Shrimp Etoufee, Crawfish Etoufee, Jambalaya, N’awlins Po Boy’s, Red Beans & Rice and authentic Gumbos. Great soups and salads, as well as a kid’s menu and take-out service available. Also, cold beer and awesome desserts. Open Monday from 11 a.m. until 8 p.m., Tuesday thru Saturday, 8:30 a.m. until 9 p.m. and Sunday, 8 a.m. until 9 p.m. Call (843) 785-3315.
sautéed shrimp with a basil lobster crème sauce over fettuccini, and of course a side of collard greens with ham hocks. This is true southern cooking, at its best. Chef Donald is passionate about encouraging the younger cooks who work with him to discover their own talents in the same way that he did. “I encourage young people in the kitchen to have fun, and to find their passion and bring out their ‘inner cooking’.” He has a hook at the door to his kitchen at Kingfisher, where he tells his co-workers to hang all their problems when they come in to work, and to take them with them when they leave. “Some of them think that’s kind of funny, but it seems to work.” When asked what he likes to do when he’s not working, Chef Donald said he likes to fish and to enjoy time with his three daughters. He wholeheartedly believes in remembering where he comes from, and thanks and dedicates his success in the kitchen to his beloved grandmother. Kingfisher is located smack in the middle of the island, at 18 Harbourside Lane, Shelter Cove Harbour across from Palmetto Dunes. Reservations may be made by calling 843-785-4442. Say hi to Chef Donald when you come in! featuring incredible drink and seafood specials. Live music and dancing with Pete Carroll on Wednesdays, classic soft rock with David Wingo on Thursdays, and jazz with Earl Williams on Fridays. Tableside magic shows on Sundays and Mondays. Call (843) 785-4442 for reservations and information or online at www.kingfisherseafood.com. KURAMA JAPANESE SEAFOOD AND STEAK HOUSE & SUSHI BAR Located at 9 Palmetto Bay Road next to Sea Pines Circle, Kurama Japanese Restaurant has been one of Hilton Head's most popular spots for tourists and locals alike. Kurama prides itself on using the freshest ingredients at both our entertaining hibachi-style tables and inviting sushi bar. Our highly-skilled chefs and family-friendly atmosphere will entertain any size party. Open daily from 4:30 until 10 p.m. Early Bird specials, children's menu and take out available. Call (843) 785-4955 for reservations or visit www.KuramaHHI.com for more information. LAND’S END TAVERN Located at South Beach Marina in Sea Pines. Featuring great seafood, steaks, sandwiches and salads. A casual atmosphere with a pirate theme ensures fun for the whole family. Great kid’s menu and desserts. It’s a bounty of treasure waiting to be plundered. Serving all day, every day starting from 8 a.m. Call (843) 671-5456 for seasonal hours. LIVE OAK - LOWCOUNTRY INSPIRED CUISINE Located in the new Plantation Golf Club, Live Oak is a fresh culinary experience showcasing Lowcountry-inspired cuisine and locally sourced produce and products. Boasting a 35-foot rotunda ceiling and floor-to-ceiling windows that provide an incredible 270 degree golf view, the restaurant offers indoor and outdoor seating options. Guests can choose from an expansive selection of local craft beers, a Wine Spectator Award-winning wine list, or a signature Bourbon collection. Open daily for breakfast, lunch and dinner, 7 a.m.–9 p.m. Reservations are suggested, please call (843) 842-1441 or visit liveoakrestaurant.com. Proper resort attire required. MANGIAMO New location, 2000 Main Street next to the Main Street Inn. A comfortable and cozy atmosphere featuring outstanding pizza, subs, salads and pasta. Beer and wine, kid’s menu, and daily specials offer something for everyone. Enjoy half price cheese pizza from 3 until 4 p.m. Dine inside, on the patio or take it to go. North Island delivery available. Your home away from home for The Ohio State Buckeyes. Open Sunday thru Thursday from 11 a.m. until 9:30 p.m., and Friday and Saturday 11 a.m. until 10 p.m. Call (843) 682-2444. A Sampling of Catch 22’s Menu Items… (A few menu items will change seasonally). Island Rd. in Bluffton. If you’re looking for a fun and lively place for the whole family, this is it. Specializing in great pizza and calzones, monumental hoagies and fresh salads all in a comfortable and casual setting. Kid friendly and affordably priced menu for both lunch and dinner. Over twenty-four beers on tap, fifty more by bottle and a full bar available. Dine inside or outside on the patio. Open daily from 11 a.m. Call (843) 686-2474 (HHI) or 706-0800 (B-Town). MICHAEL ANTHONY’S Located at 37 New Orleans Road in Orleans Plaza. Offering classic Italian cuisine. Homemade gnocchi, succulent veal dishes and creative fish preparations are offered nightly. The versatile wine list offers a broad selection designed to satisfy the novice or seasoned enthusiast. Reservations are suggested. Weekly cooking classes offered in the Tuscan inspired demonstration kitchen. The adjacent Italian Market offers a wide array of Italian wines and gourmet foods. Open Monday thru Saturday beginning at 5:15 p.m. Call (843) 785-6272 or visit www.michael-anthonys.com. OKKO RESTAURANT Located at 95 Mathews Drive in Port Royal Plaza, Suite C. Contemporary Asian cuisine served in a magnificent atmosphere. Choose from Hibachi, Thai or Chinese or relax at the sushi bar or in the lounge. Open 7 days from 11:30 a.m. until 11:30 p.m., Sunday thru Thursday and 11:30 a.m. until midnight on Saturday and Sunday. Call (843) 341-3377 for more information or directions. THE OLD OYSTER FACTORY Located on 101 Marshland Rd. Waterfront dining with expansive views of Broad Creek and beyond. Serving the Island’s best steaks and freshest seafood. Extensive wine menu and great service will guarantee a wonderful dining experience. Children’s menu and large groups welcome. Serving dinner from 4:45 p.m., 7 nights a week. Call (843) 681-6040 or online at www.oldoysterfactory.com. OMBRA Located in the Village at Wexford. Serving authentic classical Italian cuisine. Being of Italian heritage Chef Michael Cirafesi proudly promotes all of the foods and wines of Italy. He prepares all pastas, homemade gnocchi, desserts and breads daily as well as a large variety of fish, veal, beef and game additions. An extensive wine list is available with a brilliant array of wines from every region in Italy. Open nightly from 4:30 until 10 p.m. Reservations are recommended and walk-ins welcome. Call (843) 842-5505 or visit us online at www.ombrahhi.com. bakers make bread that is simply delicious and baked fresh right here every day. Offering a wide selection of fantastic food including our signature sandwiches, hot paninis, delicious soups and signature salads. Catering also available. Open daily for breakfast, lunch and dinner from 7 a.m. until 8 p.m. Call (843) 686-3838 or 757-5611. THE QUARTERDECK Long considered an island icon, The Quarterdeck offers indoor and outdoor dining with stunning sunset views overlooking Calibogue Sound. An enticing all-day menu, featuring fresh seafood appetizers, innovative and traditional sandwiches, garden salads and certified angus beef burgers, is complemented by a Wine Spectator Award-winning wine list offering 40 wines by the glass. Located at the base of the Harbour Town Lighthouse, The Quarterdeck is open daily, 11:30 a.m.–9 p.m., with seasonal live entertainment. Call (843) 842-1999. REDFISH On the corner of Palmetto Bay Rd. and Archer Rd. Serving Innovative Cuisine in a unique and inviting atmosphere. Offering local seafood, steaks, salads and nightly specials. Attached retail wine shop and bar with over 1,000 selections of fine wines. Outdoor seating available. Serving lunch Monday thru Saturday from 11:30 a.m. and dinner daily from 5 p.m. For more information call (843) 686-3388 or online at www.redfishofhiltonhead.com. REILLEY’S Located in Reilley’s Plaza just off the Sea Pines Circle and Port Royal Plaza. An Island tradition since 1982. Featuring Beef Tenderloin, Bacon Wrapped Shrimp, Fish & Chips, Cottage Pie, Burgers, Salads and much more in a casual Island atmosphere. Dine inside or on the newly renovated patio. Full bar, extensive wine list, take-out and kid’s menu available. Seasonal live entertainement. Open daily from 11:30 a.m. Call (843) 842-4414 or 681-4153 or online at www.reilleyshiltonhead.com. RUAN THAI HUT Located at 1107 Main Street. Serving Authentic Thai fare using the freshest ingredients available. Mild to very hot, you can choose the spice level of your meal. Appetizers, soups, salads, desserts and kids meals round out an extensive menu with something for all ages. Sit inside or outside on the comfortable patio. Open Monday thru Saturday for lunch and dinner. Call (843) 681-3700.
and I moved here after graduation from college in 1999,” he said. “Meeting new people is the best part of my job, whether they are co-workers or customers. I even met my wife, Allison, here, 10 years ago. We have a daughter, Presley, a year old, and will welcome our second child in May,” Alberts said. There really isn’t anything he dislikes about his job. “I believe that people who don’t like their job should be looking for something else. There’s nothing wrong with having fun and laughing while you work, and I try to make it fun. The most demanding part is trying to maintain peace in the restaurant. Whether it is an upset customer, a hung-over coworker, or a feud between co-workers, trying to keep everyone productive and happy can be a challenge.” To be successful at this job, Alberts said that work ethic is key. “You get out of it what you put into it, and you must be prepared and organized.” He treats every shift the same, whether it is Friday night of the Heritage when business is booming, or a Tuesday night in the middle of January, when business is slow. “I come into work with the same attitude, regardless of when it is. I believe that failure is the result of not being prepared.” If he could have any job in the world, Alberts said, “Everyone who knows me is aware that I have an obsession with the NFL, and my dream job would be to work in the front office for an NFL team. I not only love the games, but I have a great interest in all that goes on during the off-season.” Growing up in Pittsburgh, he was able to attend Steeler home games. “When I moved to Hilton Head, the Steelers were in the same division as the Jacksonville Jaguars, and since they play an away game in Jacksonville every year, I get season tickets to the Jaguars games.” When he’s not working, Alberts spends most of his time working on the computer and phone from home. “I like to spend time away from the restaurant with family,” he said, “and even when I’m working, I am able to have lunch with them every day.” When you step into Santa Fe Cafe, you step into the Southwest for a truly enchanted evening. Dine under the stars in their open-air, rooftop cantina, complete with an oak fire. And say hi to Bill Alberts when you’re there! For more information or to make a reservation, call Santa Fe at (843) 785-3838 or visit www.santafehhi.com. complete a perfect night out. Open for dinner Monday thru Saturday from 6 until 10 p.m. Reservations are recommended. Call (843) 785-5352 or check us out online at www.thesageroom.com. THE SALTY DOG CAFE Located at South Beach Marina in Sea Pines. Great food, frozen drinks and live entertainment from the island's favorite outdoor cafe. Enjoy beautiful waterfront views overlooking Braddock's Cove in a fun and casual atmosphere. Happy Hour daily with a full menu available, plus an outdoor cookout, Salty Dog Ice Cream and Jake's Pizza during the season. Call (843) 671-CAFE (2233) for seasonal hours. captures the spirit of New Mexico. Innovative southwestern cuisine features dinner favorites such as Tortilla Crusted Salmon, Wood Roasted Quail, Grouper, 30 oz. Ribeye and many more great selections including vegetarian items. Excellent wine list, imported beers and full bar. Early dining menu from 5 until 6 p.m. Take-out available. Reservations are “gladly” accepted. Open for dinner 7 nights a week from 5 until 10 p.m., and for lunch Monday thru Friday from 11:30 a.m. until 2 p.m. Call (843) 785-3838 or www.santafehhi.com. STEAMER SEAFOOD Located on the pond in Coligny Plaza. Featuring huge portions of fresh seafood, shellfish, sandwiches, soups, salads and desserts all served in a rustic Lowcountry atmosphere. Choose from over five fresh local catches daily. The most kidfriendly restaurant on the Island with seating inside or outside on the deck or patio. Seasonal live entertainment. Full bar and take-out available. Open from 11:30 a.m. until late, 7 days a week. Call (843) 785-2070. Located at Harbourside III on Shelter Cove Harbour. Serving Hilton Head’s freshest Mexican food for over 25 years. Dine inside or out while enjoying breathtaking views of the marina. Burrito’s, enchiladas, fajitas, chimichangas, seafood and salads plus a full bar complete with the Island’s best margarita. Kid’s menu available. Serving dinner daily from 5 p.m. and lunch from 11:30 a.m. until 5 p.m. Call (843) 842-4555.
wife Christine sing back-ups and organize crowd participation. There are lots of Jimmy Buffet tribute bands out there, but none like this one. “I wanted to create a sunset celebration like they do in Key West. The experience (on the water at Shelter Cove with the sunset background) should be just like going to a Jimmy Buffet concert but it is in a unique ‘Shannon Tanner Hilton Head style’,” he explained. The band will play all of the Buffet fan favorites like Margaritaville, Come Monday, and Son of a Son of a Sailor, but they will also throw in some other legendary tunes including a little Bob Marley and Kenny Chesney. Shannon noted that the entire Parrotpalooza Music Festival is completely family friendly and they give away 200 beach balls every show to parents and kids. In tune with other Shannon shows, audience participation is applauded and welcomed. “We have parents and kids dancing together and the girls (Kendall and Christine) get everyone doing an electric slide and this summer we are adding a limbo contest,” said Shannon. Only in their second year, Shan Tan and the Oyster Reefers are already starting to get noticed. They will kick off the summer season down at the Cloister on Sea Island and are booked down there for four concerts over the summer. The entire band was also flown to Oklahoma City recently to perform for a private birthday party. “The band is exploding. It has a lot of legs,” he exclaimed. Shannon will also have his regular seasonal family concerts in Shelter Cove this summer as well his Pirate Treasure hunts. For more information visit www.facebook.com/OysterReefers. menu items from the Little Italy section of New York and northern New Jersey. Choose from items such as Clams Casino, Veal Saltimbocca, Zuppa di Pesce, Osso Buco, Lasagna and more. Chefs specialties created nightly. Extensive wine list, Early Bird specials, children’s menu and take-out available. Serving dinner Monday thru Saturday from 5 p.m. til 9:30 p.m. Call (843) 785-7006 for reservations. SUNSET GRILLE Located on the Intracoastal Waterway at Hilton Head Harbor, 43 Jenkins Rd. The Grille offers a casual fine dining experience with breathtaking sunset views. The creative menu features house specialties such as Hugh's famous hot smoked salmon, shrimp & grits, grilled sea scallops & braised lamb shank over wild boar cassoulet all prepared to perfection by Executive Chef Doug Watson. An extensive wine list, craft beer selection and full bar available. Call (843) 689-6744 for reservations or visit us at sunsetgrillehhi.com. Dinner is served Tuesday-Sunday 6 p.m. until. Thermador, Escargot, Filet Mignon, Fried Green Tomatoes, She Crab soup and many more delicious selections. Great selection of fine wines available as well as a full bar. Catering available. Open for dinner from 5 p.m. nightly. Call (843) 681-8590. TOPSIDE WATERFRONT RESTAURANT Dine at Topside Waterfront Restaurant and enjoy its famous “Fresh Market Seafood” menu. Located directly next to the iconic Harbour Town Lighthouse, Topside offers stunning oneof-a-kind sunset views of Calibogue Sound, as well as the signature 18th fairway and green of Harbour Town Golf Links. Topside’s breathtaking views and outstanding menu are complemented by a Wine Spectator Award-winning wine list and a knowledgeable staff. Topside is open for dinner nightly, 5–9 p.m. Reservations are suggested, please call (843) 8421999 or visit seapines.com/dining. THE WRECK OF THE SALTY DOG Located at South Beach Marina in Sea Pines. Enjoy a casual and fun atmosphere in the same spirit as The Salty Dog Cafe. Serving a full bar with excellent food and waterfront view overlooking South Beach Marina and Braddock's Cove, The Wreck offers excellent Happy Hour drink and appetizer specials. Available for private parties. Call (843) 671-SEAS (7327) for seasonal hours. the four types of sauces are loosely based on geographical and cultural boundaries. The original sauce, and the one most often found in the Lowcountry, is vinegar and pepper. Its origins date back hundreds of years to Scottish settlers who made their homes along the coast. official tourism site, recently compiled a BBQ Trail Map. Listing nearly 200 restaurants from the Mountains through the Midlands to the Coast, a total of six local establishments made the cut. On Hilton Head Island, The Smokehouse on Palmetto Bay Road, One Hot Mama’s in Reilley’s Plaza and Bullies BBQ located mid-Island on Hwy. 278 were recognized. In Bluffton, Choo Choo BBQ on Burnt Church Road, Bluffton BBQ in the Historic District’s Promenade and Jim ‘N Nicks were featured on this map. Since the strict requirements for inclusion on the SC BBQ Trail were based on menu offerings and hours of operation, there are many other area restaurants serving up delicious, handpulled pork, baby-back ribs, smoked chicken and other delicious barbequed items topped with a variety of signature sauces. Visit scbbqtrail.com to download the official map, upload pictures of your most recent meal, read up on “Q” history, get recipes and meet some of state’s legendary pit masters. This summer, take a break from fast food and make time to savor a slowcooked South Carolina tradition nearly 500 years in the making. “Bite into the Birthplace of BBQ” with a culinary adventure along the SC BBQ Trail and remember where barbeque began. swordfish will pair better with a richer, more substantial white. The rule of thumb for pairing seafood dishes with a wine that best complements the flavor is to consider the cooking technique and the sauce before choosing a wine. best paired with red wine. Salmon works remarkably well with Pinot Noir, while bright red ahi tuna is so substantial that it can even pair with a medium-bodied red like Merlot. A tuna steak grilled with rosemary can be complemented with a full bodied Chardonnay. Tuna tartar, and dishes with earthy flavors, such as roasted black bass, can pair with a rose or Pinot Noir. “If you can't decide or everyone at the table is eating something different, order a bottle of nice Champagne—it's one of the most food-friendly of wines,” Margaret said. Food and Wine magazine created simple rules that will steer you to the best wine and seafood pairings. 1. Champagne is perfect with anything. 2. Choose Chardonnay for fatty fish or fish in a rich sauce. 3. Pinot Grigio pairs well with light fish dishes. 4. Pinot Noir is great for dishes with earthy flavors. 5. Sauvignon Blanc goes with tart dressings and sauces. 6. Choose Grüner Veltliner when a dish has lots of fresh herbs. 7. Dishes made with ingredients like mushrooms and truffles pair well with reds like Pinot Noir and Dolcetto, light-bodied but full of savory depth. 8. Light seafood dishes take on more flavor when matched with equally delicate white wines, such as Pinot Grigio, Chablis, and Chardonnay. 9. Pair a dry Rosé with rich sauces. 10. Silky whites - Chardonnays from California, Chile or Australia - are delicious with fish like salmon or any kind of seafood in a lush sauce. raspberries. For lunch, you can’t go wrong with a Fresh Arugula Salad. Arugula has tons of Vitamin C, calcium, and folate (which helps with proper brain function, mood management, and staving off heart disease). Adding a lean protein to your lunch is a sure fire way to feel full longer throughout your day along with adding a kick to a simple salad. Try this little gem for a fresh and light lunch: • One bowl full of arugula • 1 cup of watermelon, cubed • 2 ounces of feta crumbles • Top with 4 ounce of grilled chicken and a julienned mint leaf. • If you are feeling ambitious you can whisk together ¼ cup of orange juice, ¼ cup of lemon juice, 1 tbsp of honey, and ½ cup of olive oil to add a light vinaigrette to this lean power lunch. Simply quarter the zucchini and squash and cut the onion and pepper in to 1-inch pieces. Skewer the veggies in whatever pattern makes you happy, then brush the whole thing with olive oil. Sprinkle with salt and pepper then grill on low heat for 15 minutes. This combo is rich in Vitamin A, fiber, and potassium. These are just a few ways to enjoy the best of what Mother Nature provides at this time of year. Let me know if you try one of these delicious ideas! Christy Baroni is the Nutrition Specialist and a Coach at Conviction Training Facility, home of CrossFit Hilton Head. She is an island resident, mother of two, and competitive athlete. For more recipes and healthy living ideas, visit her nutrition blog at www.convictiontraining.com / Resources / Nutrition Blog or contact her at Christy@CrossFitHiltonHead.com or (843) 290-5803. A LOWCOUNTRY BACKYARD Located at 32 Palmetto Bay Road in the Village Exchange. Capture the true essence of the island while enjoying local and regional inspired cuisine featuring owner Dave and Raina Peck’s family recipes. Choose from Potato chip meatloaf, Charleston fried green tomato sandwich, shrimp & grits, Southern Belle salad and a wide selection of other lowcountry favorites. Dine in or outside in the comfortable backyard. Experience the island, love the food! Serving Lunch 11 a.m. - 3 p.m., and Dinner 4:30 - 9 p.m., MondaySaturday and brunch on Saturday 8 11 a.m. and Sunday 8 a.m. - 2 p.m. Call (843) 785-YARD (9273) or visit us online at www.hhbackyard.com. ANNIE O’S SOUTHERN EATS Located at the corner of Arrow and Target Road. The Island’s best southern food featuring main dishes such as Buttermilk Fried Catfish, Shrimp and Grits, Mama’s Fried Chicken, Meatloaf and Gravy and many more. Great sides, soups, salads and homemade desserts round out the menu. Full bar, cold beer and a nice wine selection. Open Monday thru Saturday from 11 a.m. until 9 p.m. Call (843) 341- 2664.
location. Happy hour nightly from 5 until 8 p.m. and carry out is also available. Serving continuously from 11 a.m. until 10 p.m. daily. Call (843) 686-9888. AUNT CHILADAS EASY STREET CAFE Located at 69 Pope Avenue. Liven up your day with lunch at Aunt Chiladas. A fun, festive atmosphere with great food and drinks. Featuring at least 5 daily lunch specials starting at $7 including meatloaf, fried chicken, fish ‘n chips and great Italian specialties served with homemade mashed potatoes and vegetables. You may also order your favorite Mexican fare from our regular menu as well as a wide variety of salads. Full bar and kid’s menu available. Serving lunch and dinner daily from 11:30 a.m. Call (843) 785-7700. THE BIG BAMBOO CAFE Just steps from the beach, the Big Bamboo Cafe is located in Coligny Plaza on North Forest Beach Drive. Featuring great seafood, delicious salads and the legendary Big Bamboo burger, the Big Bamboo Cafe provides an all American menu in a laid back beach atmosphere. Thirsty? Try a famous margarita as you sit amongst the WWII memorablia and the Bamboo inspired island vibe. Full bar and kids menu available. Serving lunch Mon-Sat. 11.30 a.m. to 4 p.m. Call (843) 686 3443. BIG JIM’S BBQ, BURGERS & PIZZA New restaurant located in Palmetto Dunes at the Robert Trent Jones Clubhouse. Big Jim’s offers signature Southern dishes, including BBQ, gourmet burgers and grilled pizza plus soups, salads, seafood, steaks and ribs. Enjoy indoor or outdoor seating with big screen TVs and golf course views. Open daily for breakfast, lunch and dinner. Hours are 7:30 a.m. until 9 p.m. Happy Hour daily 4 until 7 p.m. and seasonal live entertainment. Take out and catering available. Call (843) 7851165 or www.palmettodunes.com/big-jims. BRITISH OPEN PUB Located in The Village at Wexford and Sheridan Park in Bluffton. Authentic English fare served in attractive pub-style atmosphere with golf art, memorabilia, and the only bar by Titleist. Featuring our famous Fish n’ Chips or Sandwedges like the Aberdeen Burger, Clubhouse Classic, Wexford Reuben, English Dip and Lobster Roll. Full bar and beers, ales, and stouts from around the world. Serving daily from 11 a.m. until 10 p.m., Saturday and Sunday Brunch 9 a.m. until 2 p.m. Call Hilton Head (843) 686-6736 or Bluffton 815-6736. CAPTAIN WOODY’S All New Location at 6 Target Road on Hilton Head and in Bluffton at the Calhoun Street Promenade. A local favorite for 30 years! Unique Island Location highlights fresh seafood, daily specials, great signature sandwiches (Grouper melt & Po Boy’s) and more in one of Hilton Head’s favorite dining destinations. Fantastic outdoor deck and bar. Open daily from 11 a.m. until late. Call (843) 785-2400 or 757-6222 or online at www.captainwoodys.com. CHARBAR CO Located in Park Plaza right outside Sea Pines Plantation on Hilton Head. A local favorite serving a chef inspired menu featuring award winning gourmet burgers, signature sandwiches, veggie and shrimp burgers and salads that are as great as our burgers — all for around $8-10 with quick casual dining experience. We feature a fun and inviting indoor/outdoor environment with a full bar and a music collection spanning the decades. Voted Hilton Head Island “People’s Choice Best Burger”, 1st Place Winner of Burgers & Brews 2012 and 2013! Open daily from 11:30-10 p.m. Kids menu and takeout available. Call us at (843) 785-CHAR (2427) or visit us online at www.Facebook.com/CharbarCo! 2 p.m., and dinner Monday thru Saturday from 5:30 p.m. Call (843) 785-9277 or check us out online at www.charliesgreenstar.com. THE CHART HOUSE (Formally Charley’s Crab) Located at Two Hudson Rd., just off Squire Pope Rd. Serving up sensational food prepared by Executive Chef Eric Seaglund, accompanied by spectacular water views of the Intracoastal waterway and extraordinary service. The expansive menu features fresh fish, pristine seafood, succulent steaks, Lowcountry specialties and an extensive collection of fine wines and decadent desserts. Relax on the expanded contemporary patio. Open for lunch and dinner daily, as well as Sunday Brunch. Happy hour offered daily from 4 until 8 p.m. Reservations are recommended. Call (843) 342-9066 or online at www.chart-house.com. the Island. Coco’s grill menu offers something for the entire family. Live entertainment Friday’s 6-9 p.m. Visit our website at Cocosonthebeach.com or become a fan of Coco’s on Facebook. Call for seasonal hours. For directions and information, Call (843) 842-2626 (COCO). COLIGNY DELI AND GRILL Specializing in Philadelphia cheesesteaks, awesome reubens and great sandwiches featuring Thuman’s fine deli meats. Burgers, dogs and fries as well! Or try our southern treat FritoPie! Fantastic Kids menu too! Eat in, dine outside, or call ahead to take out. Don’t forget to get your picture with Mooey Looey to remember your visit. Located in Coligny Plaza next to Coligny Hardware. Call (843) 785-4440. CRAZY CRAB There are two great waterfront locations- one in Harbour Town in Sea Pines and the other on Hwy. 278 overlooking Jarvis Creek. Fresh local seafood served any way you like in two picturesque settings. Casual dining and great family fun. A kid’s menu is available and children will be entertained by our onsite playground and the largest saltwater aquarium on Hilton Head (Jarvis Creek Location). Serving lunch and dinner 7 days a week. Call (843) 363-2722 (Harbour Town) or 6815021 (Jarvis Creek) or visit us online at thecrazycrab.com. favorite of both visitors and locals. Choose from Neopolitan pizza, fresh pasta, gourmet salads, or hearty sandwiches all cooked in our open hearth oven. Hang out in our friendly lounge and enjoy a nice selection of appetizers and cocktails while viewing your favorite sporting event on our HDTV’s. Open daily from 11:30 a.m. for lunch and dinner. Call (843) 341-2225 or online at www.flatbreadgrillhhi.com. THE FROSTY FROG CAFÉ ELA’S BLU WATER GRILLE Located at One Shelter Cove Lane. Waterfront dining, fresh catch seafood, and prime steaks of the highest quality delight the senses at ELA’s Blu Water Grille. This quaint, unique restaurant offers a pleasantly casual and intimate interior with gorgeous views of Shelter Cove Harbor. The kitchen, supervised by Chef Meagen Mehaffey, makes the most of global resources, putting a modern spin on local island offerings. Our first class wine selection from boutique vineyards compliments each culinary masterpiece. Live entertainment is featured weekly. Serving lunch Sunday thru Friday from 11:30 a.m. - 2:30 p.m. and dinner daily from 5 pm. Call us at (843) 785-3030 or visit us online at www.elasgrille.com. Located in Coligny Plaza. A comfortable, casual atmosphere offering a “web-footed lickin” menu and an enormous amount of frozen daiquiris by the glass or by the gallon. Outside seating with retractable roof, beach area and tiki bar. Certified black angus burger, crab cakes, pizza, prime rib sandwich, salads, subs, wraps, peel and eat shrimp, calamari and of course fried frog legs. 28 HD TV’s for great sports viewing and NTN Trivia is also available as well as a kid’s menu. Open for lunch and dinner daily from 11 a.m. Call (843) 686-FROG (3764) or online at www.frostyfrog.com. HARBOURSIDE BURGERS & BREWS Located near Harbour Town’s famed Liberty Oak, this seasonal open-air café offers a relaxed atmosphere overlooking the Harbour Town Yacht Basin and specializes in tasty frozen drinks and a variety of sandwiches, burgers and salads. Call (843) 842-1444 or online, seapines.com/dining. THE HARBOUR TOWN BAKERY & CAFÉ Located across from Harbour Town Playground. Known for great home-cooked breakfasts, soups, salads, paninis and pastries, everything is baked fresh daily. Lunch served daily, 11:30 a.m. – 2:30 p.m. Dine in or grab to go. 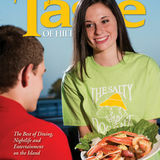 Call (843) 3632021or online seapines.com/dining. out available. Open for lunch from 11:30 a.m. until 2 p.m., Monday thru Friday and dinner from 5:30 until 10 p.m., Monday thru Saturday. Call (843) 785-9800. HOLY TEQUILA Located in Park Plaza, the Holy Tequila taqueria blends gourmet tacos with American flavors, Mexican street food and tequila in an eclectic atmosphere! Prepare your senses for a fusion of flavors that reaches into the heart of Mexico! Holy Tequila combines an open kitchen with indoor/outdoor dining and a dynamic bar to create a high energy fiesta! We serve gourmet tacos, quesadillas, and smalls plates all under $10 with a full bar offering over 40 kinds of premium tequilas. The cuisine is modern, fun and uninhibited, just like our guests! The restaurant is open 12 p.m. to 11 p.m. daily with happy hour specials from 4-7 p.m. Call us at (843) 681-TACO (8226) or visit us online at www.Facebook.com/HolyTequila! . the deck bar. Featured on the Food Network and in Bon Appétit. Open daily at 11 a.m. Call (843) 681-2772. KENNY B’S CAJUN SEAFOOD HUT Located in Circle Center, just off Pope Avenue. Enjoy Creole cuisine with a Lowcountry influence. Find an appealing choice of Cajun fare such as Shrimp Etoufee, Crawfish Etoufee, Jambalaya, N’awlins Po Boy’s, Red Beans & Rice and authentic Gumbos. Great soups and salads, as well as a kid’s menu and take-out service available. Also, cold beer and awesome desserts. Open Monday from 11 a.m. until 8 p.m., Tuesday thru Saturday, 8:30 a.m. until 9 p.m. and Sunday, 8 a.m. until 9 p.m. Call (843) 785-3315. KURAMA JAPANESE RESTAURANT Located just off of Sea Pines Circle at 9 Palmetto Bay Road, Kurama Japanese Restaurant now offers delicious express lunches from our hibachi grill and sushi bar. Enjoy our fresh and authentic dishes featuring teriyaki chicken, steak and shrimp as well as our most popular sushi rolls. Kurama is open for lunch from 11:30 a.m. - 2:30 p.m. and dinner from 4:3010:00 p.m. Reservations are accepted. Call (843) 785-4955 or visit us online at www.kuramahhi.com. MELLOW MUSHROOM Located in Park Plaza on Hilton Head and at 878 Fording Island Rd. in Bluffton. If you’re looking for a fun and lively place for the whole family, this is it. Specializing in great pizza and calzones, monumental hoagies and fresh salads all in a comfortable and casual setting. Kid friendly and affordably priced menu for both lunch and dinner. Over twenty-four beers on tap, fifty more by bottle and a full bar available. Dine inside or outside on the patio. Open daily from 11 a.m. Call (843) 686-2474 (HHI) or 706-0800 (B-Town). available as well as take-out and childrens menu. Eat inside or relax on the outside patio. “One of the Best Breakfasts on Hilton Head”, Southern Living magazine. Open Daily Monday thru Friday, 6 a.m.-2 p.m. and Saturday and Sunday, 6 a.m.3 p.m. Call (843) 686-3232 for more information. PANERA BREAD Located at 1012 William Hilton Parkway, just before the Sea Pines circle and Bluffton at Tanger 1 Outlet. With the skill of an Artisan, the heat of the oven and a few fine ingredients our bakers make bread that is simply delicious and baked fresh right here every day. Offering a wide selection of fantastic food including our signature sandwiches, hot paninis, delicious soups and signature salads. Catering also available. Open daily for breakfast, lunch and dinner from 7 a.m. until 8 p.m. Call (843) 686-3838 or 757-5611.
lunch Monday thru Saturday at 11:30 a.m., and Sunday brunch from 7:30 a.m. until 2 p.m. Call (843) 785-9020, 342-4472 or 815-4445. THE QUARTERDECK Located at the base of the Harbour Town Lighthouse. Long considered an island icon, The Quarterdeck offers indoor and outdoor dining with stunning sunset views overlooking Calibogue Sound. An enticing all-day menu, featuring fresh seafood appetizers, innovative and traditional sandwiches, garden salads and certified angus beef burgers, is complemented by a Wine Spectator Award-winning wine list offering 40 wines by the glass. The Quarterdeck is open daily, 11:30 a.m.–9 p.m., with seasonal live entertainment. Call (843) 842-1999. REDFISH On the Corner of Palmetto Bay Rd. and Archer Rd. Serving Innovative Cuisine in a unique and inviting atmosphere. Specializing in excellent seafood, steaks, salads and daily specials. Attached bar and retail wine shop with over 1,000 selections of fine wines. Outdoor seating available. Serving lunch Monday thru Saturday from 11:30 a.m. and dinner daily from 5 p.m. Call (843) 686-3388 or online at www.redfishofhiltonhead.com. REILLEY’S Located in Reilley’s Plaza just off the Sea Pines Circle and Port Royal Plaza. A long running lunch destination, Reilley’s offers fish & chips, pasta, burgers, great sandwiches, soups, salads, seafood and much more in a casual Island atmosphere. Dine inside or outside on the newly renovated patio. Full bar, take-out and kid’s menu available. Open daily from 11:30 a.m. Call (843) 842-4414 or 681-4153 or online at www.reilleyshiltonhead.com. SAN MIGUELâ&#x20AC;&#x2122;S MEXICAN CAFE Located at Harbourside III on Shelter Cove Harbour. A great combination of beautiful views and Mexican delicacies makes this the perfect spot for food from south of the border. Burritos, enchiladas, fajitas, chimichangas and more Mexican fare offers something for everyone. Open for lunch daily from 11:30 a.m until 5 p.m. Dine inside or out. Call (843) 842-4555. SANTA FE CAFĂ&#x2030; Located at 807 William Hilton Parkway near the entrance to Palmetto Dunes. Our elegant yet casual, cozy atmosphere captures the spirit of New Mexico. Innovative southwestern cuisine featuring our Quesadilla Soup and Salad Trio, Santa Fe Salad, Fish Tacos, Steak Fajitas and many other great lunch selections. Excellent wine list, wide selection of imported beer and full bar. Take-out available. Open for lunch Monday thru Friday from 11:30 a.m. until 2 p.m. and Dinner 7 nights a week from 5 p.m. until 10 p.m. Call (843) 785-3838. STEAMER SEAFOOD Located on the pond in Coligny Plaza. Fresh seafood, shellfish, sandwiches, salads, soups and desserts all served in a rustic Lowcountry atmosphere. Try one of our famous baskets with your choice of chicken, fish, shrimp or oysters. The most kid-friendly restaurant on the Island with seating inside or outside on the deck or the patio. Full bar and takeout available. Open for Lunch daily at 11:30 a.m. Call (843) 785-2070. Summer is here and families are flocking to Hilton Head Island to make the most of their time in the sun. In addition to miles of white-sand beaches and bicycle trails, golf or tennis lessons, day camps and countless dining and shopping options, there are plenty of other hot-weather adventures, concerts, festivals and special events to keep kids and their keepers entertained. Play all day and party all night â&#x20AC;&#x201C; or at least until bedtime â&#x20AC;&#x201C; with this handy guide to some of family-friendly happenings taking place throughout the Lowcountry this season. Russell has entertained generations of families with original songs, silly games and crazy fun. Beginning May 23 and running through Labor Day weekend, Russell’s complimentary concerts take place under the Liberty Oak, Sunday through Friday nights from 8-9:30 p.m. Saturday evenings, the talented teens that make up The Steppin Stones bring the crowd to their feet with a unique blend of Classic/Southern Rock and original tunes starting at 7:30 p.m. On Independence Day, the celebration begins early with a July 4th Parade kicking off from under the candy-striped Harbour Town Lighthouse at 9:30 a.m. Meet in the parking lot adjacent to the lighthouse an hour earlier to register and pick up decorations for your bikes, dogs and kids. Entries will be judged on patriotism with assorted holiday activities taking place after the parade. Fireworks will light up the sky over Harbour Town on July 4, so be sure to head back over early that evening to find a parking spot to enjoy food, fun and entertainment before the finale at 9 p.m. For details and reservations on activities in The Sea Pines Resort, contact the Recreation Department at (843) 842-1979 or view the online calendar at www.seapines.com. In the heart of Sea Pines, Lawton Stables offers Western-style trail rides through the Sea Pines Forest Preserve, pony rides for younger visitors, a Small Animal Farm and an International Riding Academy. Open daily from 8 a.m.-5 p.m., admission is free to see the collection of goats, sheep, donkeys, pot-bellied pigs, a llama and miniature pony, chickens and rabbits or call ahead to make trail ride reservations. (843) 6712586 or www.lawtonstables.com. entertainment and line dance instruction on Wednesdays. Thursday nights, Hannah Wicklund and The Steppin Stones rock Coligny followed by singer/songwriter Luke Mitchell, a one man band, showcased on Friday. Over the weekend, Connor Hollyfield performs popular music on Saturday with young singer/songwriter Taylor Kent rounding out the lineup with her Sunday show. Visit www.colignyplaza.com for the complete list of stores, restaurants a nd summer entertainment or call (843) 842-6050.
and entertainment on the outside deck, savor fresh seafood, cookout favorites and ice cold drinks at his namesake restaurant or one of the other delicious waterfront establishments or chill out with an ice cream cone before picking up the perfect souvenir at one of the unique shops. For the summer entertainment schedule, as well as information on all dining and shopping options at South Beach Marina, check out www.saltydog.com. The entertainment is billed as “funny not filthy” at the Hilton Head Comedy Magic Cabaret upstairs at the Kingfisher Restaurant in Shelter Cove Harbour. Veteran Vegas performer, Kerry Pollock, headlines the club on a regular basis where he is often joined by national touring comedians and magicians, such as Dana Daniels and Jimmy Carroll. Tuesday night is Open Mic Night led by veteran stand-up comic John Biddle. Described as “Jeopardy meets the Three Stooges without the wimpy buzzers,” the Friday night BONK! Show is appropriate for both older teens and adults. This original comedy game show delivers an evening of mayhem and laughter with trick questions, comedy and music, audience participation and prizes. On Sundays, magician Gary Maurer brings his matinee Family Magic Show to the stage combining humor and sleight of hand to create a magical evening for all ages. For show times, directions and reservations, call (843) 6817757 or purchase tickets online at comedymagiccabaret.com. Next door at Shelter Cove Community Park, the Island Rec. Center hosts the weekly Shelter Cove Farmers Market every Tuesday from 4-7 p.m. with plenty of farm-fresh fruit and vegetables, baked goods, specialty foods, local vendors and more. The party in the park continues with Summer Jams on Tuesday nights starting June 17. From 7-10 p.m., enjoy music, dancing, food and other family fun before watching the fireworks over Shelter Cove. Cool off on July 1 when the Island Rec. Center hosts Water Fun Day with inflatable water bounce houses and slides, barbeque, pizza, hot dogs, drinks and more from 7-10 p.m. Admission proceeds benefit the Rec. Center’s Scholarship Fund. If all that is not enough fun for the little ones, let them spend an evening swimming, playing games, making arts & crafts, eating pizza and watching a movie during Kid’s Night Out at the Rec. Center on June 27 and July 11. Call (843) 681-7273 or visit www.islandreccenter.org for reservations detailed event information. With its panoramic views of Broad Creek, outdoor decks and Broad Creek Back Bar, the Old Oyster Factory on Marshland Road is the place to relax and enjoy summertime on Hilton Head Island. In addition to drink specials, great food, live music and a professional juggler, it is also the perfect spot to see the Tuesday night fireworks. (843) 681-6040 or www.oldoysterfactory.com. Another local restaurant serving up a heaping helping of family fun is Hudson’s Seafood House on the Docks. Overlooking Port Royal Sound and employing the largest fishing fleet on the Island, dine on fresh seafood, sip delicious cocktails or ice-cold beverages and catch some of the area’s best performers at the Deck Bar. On Independence Day, stake out a spot on the grass to see the fireworks launched from a barge in Skull Creek after enjoying the food, entertainment and camaraderie found only at this Island landmark. (843) 681-2772 or www.hudsonsonthedocks.com. A LOWCOUNTRY BACKYARD Located at 32 Palmetto Bay Road in the Village Exchange. Capture the true essence of the island while enjoying local and regional inspired cuisine featuring owner Dave and Raina Peck’s family recipes. Choose from Uncle Bill’s biscuits and gravy, James Island crab cake benedict, Backyard benedict, Bananas Foster french toast and a wide selection of other lowcountry favorites. Dine in or outside in the comfortable backyard. Experience the island, love the food! Serving Lunch 11 a.m. - 3 p.m., and Dinner 4:30 - 9 p.m., Monday-Saturday and brunch on Saturday 8 a.m. - 2 p.m. and Sunday 8 - 2 p.m. Call (843) 785-YARD (9273) or visit us online at www.hhbackyard.com. AUNT CHILADAS EASY STREET CAFE Located at 69 Pope Avenue. There’s no place like Aunt Chiladas for Sunday Brunch. Featuring omelets, made to order waffles, smoked bacon, link sausage, garlic hash browns, fruit salad, cheese grits, English muffins and more. Catch your favorite team on one of our 18 flat screen TVs screens, including 6 plasma’s while enjoying a Bloody Mary, Mimosa, Margarita or a wide variety of other beverages. Serving Sunday Brunch from 11:30 a.m. until 2 p.m. Call (843) 785-7700. BIG JIM’S BBQ, BURGERS & PIZZA New restaurant located in Palmetto Dunes at the Robert Trent Jones Clubhouse. Big Jim’s serves breakfast daily from 7 until 10 a.m. featuring classic favorites plus the $5 breakfast special. Enjoy a bloody mary or mimosa to start your day. Lunch and dinner daily featuring BBQ, gourmet burgers and grilled pizza. Hours are 7:30 a.m. until 9 p.m. Happy Hour every day 4 until 7 p.m. and seasonal live entertainment. Take out and catering available. Call (843) 785-1165 or www.palmettodunes.com/big-jims. benedict, prime rib benedict, French toast, omelettes and much more. Wash it all down with a Captain Woody’s Bloody Mary, May River Mimosa or Promenade Poinsetta. Open for brunch on Sunday’s only from 11 a.m. until 2 p.m. Call (843) 785-2400 or 757-6222 or online at www.captainwoodys.com. Located in The Village at Wexford and Sheridan Park in Bluffton. Fabulous Brunch served in an authentic English style pub. Choose from Watson’s Steak & Eggs, Eggs Faldo (Benedict), Old Tom Morris Omelette, Pancakes, Blueberry French Toast and more. Add a bottomless glass of champagne or mimosa for $3.99 or bloody mary for $6.99. Open for Saturday and Sunday Brunch from 9 a.m. until 2 p.m. Call Hilton Head (843) 686-6736 or Bluffton 815-6736. Located at One Shelter Cove Lane. Waterfront dining, fresh catch seafood, and prime steaks of the highest quality delight the senses. This quaint, unique restaurant offers a pleasantly casual and intimate interior with gorgeous views of Shelter Cove Harbor. The kitchen, supervised by Chef Meagen Mehaffey, makes the most of global resources, putting a modern spin on local island offerings. Live entertainment is featured weekly. Serving Brunch Sunday 11 a.m. until 2 p.m. Call us at (843) 785-3030 or visit us online at www.elasgrille.com. fresh. Open daily, 7:30 a.m. – 2:30 p.m., breakfast is available all day. Dine indoors or outdoors, or grab to go. Call (843) 363-2021. seapines.com/dining. HUGO’S Located at 841 William Hilton Parkway at South Island Square. Hugo’s Brunch features Brunch classics and originals such as Crème Brulee French Toast, Omelettes, Crabcake Benedict, Bourbon Ribeye & Eggs, Honey Pecan Waffles as well as many of our lunch sandwiches and favorites from Hugo’s lunch menu. Bottomless mimosa’s and Bloody Mary’s are available. Tableside flaming crepes and desserts also available! Enjoy Sunday Brunch at Hugo’s from 9 a.m. until 2 p.m. Call (843) 785-HUGO (4846) or click to HugosHiltonHead.com for the full Brunch menu. KENNY B’S CAJUN SEAFOOD HUT Located in Circle Center, just off Pope Avenue. Enjoy Creole cuisine with a Lowcountry influence. Our Sunday brunch buffet features beignets, scrambled eggs, pancakes, bacon, sausage, grits, fruit and a made-to-order omelette station with eggs benedict. For a sampling of our regular weekday menu, choose from french toast, crabcake benedict, Mississippi tall stack pancakes, café au lait, quiche and a creole omelette. Open Monday from 11 a.m. until 8 p.m., Tuesday thru Saturday, 8:30 a.m. until 9 p.m. and Sunday, 8 a.m until 9 p.m. Call (843) 785-3315. LAND’S END Located in Sea Pines at South Beach Marina overlooking beautiful Braddock's Cove, Land's End Tavern is one of the few Hilton Head Island restaurants with a spectacular, waterfront view. Complete with a broad selection of breakfast favorites, plus Lowcountry staples like Crab Cake Benedict and Shrimp and Grits. Land's End Tavern is a casual atmosphere with a pirate theme that the whole family will enjoy. Open daily from 8 a.m. Call (843) 671-5456 for seasonal hours. LIVE OAK - LOWCOUNTRY INSPIRED CUISINE Located in the new Plantation Golf Club, Live Oak is a fresh culinary experience showcasing Lowcountry-inspired cuisine and locally sourced produce and products. Boasting a 35-foot rotunda ceiling and floor-to- ceiling windows that provide an incredible 270 degree golf view, the restaurant offers indoor and outdoor seating options. Guests can choose from an expansive selection of local craft beers, a Wine Spectator Award-winning wine list, or a signature Bourbon collection. Open daily for breakfast, lunch and dinner, 7 a.m.–9 p.m. Reservations are suggested, please call (843) 842-1441 or visit liveoakrestaurant.com. Proper resort attire required. Islander favorite for breakfast and brunch featuring eggs benedict, omelettes, french toast, pancakes, quiches, daily specials an more. Enjoy a bloody mary, mimosa, coffee or your favorite beverage while dining inside or on the patio. “One of the Best Breakfasts on Hilton Head”, Southern Living magazine. Open Daily Monday thru Friday, 6 a.m.-2 p.m. and Saturday and Sunday, 6 a.m.-3 p.m. Call (843) 686-3232 for more information. PANERA BREAD Located at 1012 William Hilton Parkway, just before the Sea Pines circle and Bluffton at Tanger 1 Outlet. With the skill of an Artisan, the heat of the oven and a few fine ingredients our bakers make bread that is simply delicious and baked fresh right here every day. Offering a wide selection of hot breakfast sandwiches and freshly baked bagels. Choose from a variety of coffee drinks, smoothies, espresso drinks and more. Open daily for breakfast, lunch and dinner from 7 a.m. until 8 p.m. Call (843) 686-3838 or 757-5611.
beverages to complete any meal. Open for breakfast, Monday thru Saturday from 6:30 a.m. until 11:30 a.m. and Sunday 7:30 a.m. until 2 p.m. for breakfast and brunch. Call (843) 785-9020, 342-4472 or 815-4445. REILLEY’S Located in Reilley’s Plaza just off the Sea Pines Circle and Port Royal Plaza. Quite possibly, The Island’s longest running brunch. Our legendary brunch features Eggs Benedict, Omelettes, Steak and Eggs, as well as all of our regular lunch items. Complimentary Mimosas and Champagne are served with all brunch items. Dine inside or on the newly renovated patio. Serving Brunch on Sunday from 11 a.m. Call (843) 8424414 or 681-4153 or online at www.reilleyshiltonhead.com. SUNSET GRILLE Located on the Intracoastal Waterway at Hilton Head Harbor, 43 Jenkins Rd. The Grille offers a casual fine dining experience with breathtaking sunset views. One of the best brunches on Hilton Head. Offering Linda's deep dish-quiche, fried chicken & biscuits with bacon gravy, filet mignon over bleu cheese grits, crab cake benedict and many more island favorites. Voted one of the best bloody mary's in the Southeast by Garden & Gun Magazine. An amazing brunch with an amazing view. Call (843) 689-6744 for reservations. Sunday Brunch is 11 a.m. - 1:30 p.m. Online at www.sunsetgrillehhi.com. for everyone with a focus on comfort food, Southern inspired cuisine, great burgers, and fresh and local seafood. They will run specials like Monday pizza night this summer as well as golf cart drive-in movies. If you are looking for somewhere to celebrate July 4th this year, it promises to be a big family celebration at Bloody Point. They offer overnight accommodation options that range from condos to homes. Island Accommodations can also set you up with overnight packages that include homes and villas with anywhere from 3 to 6 bedrooms and all rentals come with a golf cart. According to owner Krissy Roberts, the larger homes that they rent at Melrose are great for reunions, weddings and large groups as there is golf, beach, and pool galore. They will be happy to arrange private transportation for their guests who are running on a tight schedule. Enjoy your visit to Daufuskie. It is one of those places that will keep your camera clicking and keep you coming back for more. ASIAN BISTRO Located at 51 New Orleans Rd., just off the Sea Pines circle. Sleek contemporary style restaurant offering Chinese, Japanese and Thai cuisine as well as a nice selection of dim sum choices. Enjoy happy hour daily from 5 until 8 p.m. featuring $2.99 house wines, wells and beers. Relax at the traditional bar or enjoy some amazing sushi at one of the island’s best sushi bars. Serving continuously from 11 a.m. until 10 p.m. daily. Call (843) 686-9888. AUNT CHILADAS EASY STREET CAFE Located at 69 Pope Avenue. Voted the Island’s best Happy Hour. Awesome Happy Hour menu featuring special prices on steamed shrimp, chicken wings, tacos, Mexican pizzas and Alaskan Snow Crab Legs. Drink specials include a gold dollar back on any liquor drink and a Kennedy half dollar back on any beer or wine selection. Catch your favorite team on one of our 18 flat screen TVs, including 6 plasma’s while enjoying your favorite fare from our regular menu. Open daily from 11:30 a.m. Call (843) 785-7700. THE BIG BAMBOO CAFE Located upstairs at Coligny Plaza, Oceanside. The Island’s finest selection of imported and microbrewed draft beer in a unique 1940’s themed bar. Awesome happy hour with Margarita Madness and many other specials. Live music during dinner Friday and Saturday. Call for late night entertainment schedule. Full menu available. Open from 11:30 a.m. until 2 a.m., Monday thru Saturday. Call (843) 686-3443. BIG JIM’S BBQ, BURGERS & PIZZA New restaurant located in Palmetto Dunes at the Robert Trent Jones Clubhouse. Big Jim’s features a wine and beer menu, delicious appetizers and Happy Hour daily from 4 until 7 p.m. in a casual atmosphere. Enjoy seasonal live entertainment, big screen TVs and outdoor seating overlooking the golf course. Big Jim’s serves breakfast, lunch and dinner daily featuring BBQ, gourmet burgers and grilled pizza. Hours are 7:30 a.m. until 9 p.m. Take out and catering available. Call (843) 7851165 or www.palmettodunes.com/big-jims. encouraged and good humor admired. Open daily from 11 a.m until late. Saturday and Sunday Brunch from 9 a.m. until 2 p.m. Call (843) 686-6736 or Bluffton 815-6736. CAPTAIN WOODY’S All new location at 6 Target Road on Hilton Head and in Bluffton at the Calhoun Street Promenade. A local favorite for 30 years for fresh seafood and fine beverages. Great signature sandwiches (Grouper Melt & Po Boy’s), oysters, crab legs, shrimp and scallops served with your favorite beer, wine or cocktail. Happy Hour from 4 p.m. until 7 p.m. daily with great prices. Fantastic outdoor deck and bar. Open daily from 11 a.m. until late, food available until 10 p.m. Call (843) 785-2400 or 757-6222 or online at www.captainwoodys.com. CATCH 22 FRESH SEAFOOD & GRILL Located at 37 New Orleans Road in Orleans Plaza. A great choice for some of the Island’s best Happy Hour deals. Relax in a comfortable and cozy atmosphere and choose from great seafood appetizers and beer, wine and liquor specials. A full menu is also available at the bar as well as a wide selection of fine wines. Happy Hour from 5 to 6:30 p.m. daily and dinner served from 5 p.m. Call (843) 785-6261. CHARBAR CO Located in Park Plaza right outside Sea Pines Plantation on Hilton Head. A local favorite serving award winning gourmet burgers, sandwiches, salads and more! We feature specialty craft beers on tap, niche wines, two full service bars, and a lounge equipped with a music collection spanning the decades in a fun indoor/outdoor environment. Voted Hilton Head Island “People’s Choice Best Burger”, 1st Place Winner of Burgers & Brews 2012 and 2013! Enjoy our large outdoor patio with flatscreens, fireplace and the only outdoor bar in Park Plaza! Happy Hour specials daily from 4-7 p.m.! Live music nightly! Call (843) 785-CHAR (2427) or visit us online atwww.Facebook.com/CharbarCo! THE CHART HOUSE (Formally Charley’s Crab) Located at Two Hudson Rd., just off Squire Pope Rd. Serving up sensational food prepared by Executive Chef Eric Seaglund, accompanied by spectacular water views of the Intracoastal waterway and extraordinary service. The expansive menu features fresh fish, pristine seafood, succulent steaks, Lowcountry specialties and an extensive collection of fine wines and decadent desserts. Relax on the expanded contemporary patio. Open for lunch and dinner daily, as well as Sunday Brunch. Happy hour offered daily from 4 until 8 p.m. Call (843) 342-9066 or online at www.chart-house.com. Reservations are recommended. Select bar menu and full dinner menu available at the bar. Open Monday thru Saturday. Call (843) 785-9277 or check us out online at www.charliesgreenstar.com. COCO’S ON THE BEACH Located at the end of the boardwalk at Hilton Head Resort mile marker 7 or on the beach at beach marker 94A Singleton Beach. Just steps from the beach with a spectacular ocean view. Coco’s is an authentic beach bar and grill with a casual friendly atmosphere; your place for island enjoyment. Unwind ocean side in the Carolina sun with one of the largest selections of Beer, Rum, Tequila and the best Margarita’s on the Island. Coco’s grill menu offers something for the entire family. Visit Coco’s website Cocosonthebeach.com or become a fan of Coco’s on Facebook. Seasonal live entertainment. Call for seasonal hours. For directions and information, call (843) 842-2626 (COCO). CRANE’S TAVERN STEAKHOUSE & SEAFOOD Located at 26 New Orleans Rd. Relax around our antique Old English bar and enjoy a cocktail, appetizer, sandwich or full meal. Select from our extensive wine and liquor list, true classic cocktails, infused martinis, aged scotches and small batch bourbons. Great bar menu and happy hour from 4 to 6 p.m. daily. A family tradition of excellence in quality and value for over 100 years. Serving dinner daily from 5 p.m. Call (843) 341-2333. CRAZY CRAB There are two great waterfront locations- one in Harbour Town in Sea Pines and the other on Hwy. 278 overlooking Jarvis Creek. Fresh local seafood served any way you like in two picturesque settings. Casual dining and great family fun. Happy Hour serves up drink specials from 4 until 6 p.m. in the bar at both locations. Serving lunch and dinner 7 days a week. Call (843) 363-2722 (Harbour Town) or 681-5021 (Jarvis Creek) or visit us online at www.thecrazycrab.com. THE DRYDOCK SEAFOOD GRILL & SPIRITS Located at 21 Office Park Rd. in the Sapelo building. Go where the locals go for fresh seafood, cold drinks and good times. Fantastic outdoor bar and deck is the perfect place to enjoy a cool cocktail and some of the island’s best seafood. Great happy hour specials and plenty of TV’s for all your favorite sporting events. Open 7 days for lunch and dinner from 11:30 a.m. Call (843) 842-9775. Located at 8 New Orleans Rd., just off Hwy. 278. Casual yet sophisticated atmosphere. Relax on the leather couch or sit at the bar with Jeff and try one of his famous real chocolate martinis or one of his other unique concoctions. Full bar, extensive wine and beer offerings, and happy hour specials including half price wines by the glass, from 5 until 7 p.m.
resources, putting a modern spin on local island offerings. Our first class wine selection from boutique vineyards compliments each culinary masterpiece. Live entertainment is featured weekly. Serving lunch Sunday thru Friday from 11:30 a.m. - 2:30 p.m. and dinner daily from 5 p.m. Call us at (843) 785-3030 or visit us online at www.elasgrille.com. FLATBREAD GRILL Located at Coligny Circle oceanside in the Beach Market Center. This upscale casual dining sensation is sure to be a favorite of both visitors and locals. Choose from Neopolitan pizza, fresh pasta, gourmet salads, or hearty sandwiches all cooked in our open hearth oven. Catch your favorite sporting event on one of our HD TV’s. Enjoy Happy Hour from 4 - 6 :30 p.m. featuring $4 cocktails, beer and wine and $3 appetizers. Open daily from 11:30 a.m. for lunch and dinner. Call (843) 341-2225 or online at www.flatbreadgrillhhi.com. THE FROSTY FROG CAFÉ Located in Coligny Plaza. A comfortable, casual atmosphere offering a “web-footed lickin” menu and an enormous amount of frozen daiquiris by the glass or by the gallon. Outside seating with retractable roof, fire pit, beach area and tiki bar. Live music nightly. Certified black angus burger, crab cakes, pizza, prime rib sandwich, salads, subs, wraps, appetizers and of course fried frog legs. 28 HD TV’s for great sports viewing and NTN Trivia is also available as well as a kid’s menu. Open for lunch and dinner daily from 11 a.m. Call (843) 686-FROG (3764) or online at www.frostyfrog.com. HOLY TEQUILA Located in Park Plaza, the Holy Tequila taqueria blends gourmet tacos with American flavors, Mexican street food and tequila in an eclectic atmosphere! Prepare your senses for a fusion of flavors that reaches into the heart of Mexico! Holy Tequila combines an open kitchen with indoor/outdoor dining and a dynamic bar to create a high energy fiesta! We serve gourmet tacos, quesadillas, and smalls plates with a full bar offering over 40 kinds of premium tequilas and live music at night. The cuisine is modern, fun and uninhibited, just like our guests! The restaurant is open 12 p.m. to 11 p.m. daily with happy hour specials from 4-7 p.m.! Call us at (843) 681-TACO (8226) or visit us online at www.Facebook.com/HolyTequila! THE JAZZ CORNER Located in the "corner" of The Village at Wexford. Voted "Best Live Entertainment Venue". Our intimate, elegant atmosphere is the perfect setting to enjoy an evening of world-class entertainment enhanced by our innovative southern flavors menu and impeccable service. The Jazz Corner offers a signature martini menu, extensive wine list, full bar and late-night menu. Open nightly from 6 p.m. Reservations are recommended. Call (843) 842-8620 or check us out online at www.thejazzcorner.com. waterfront views from inside or on the outside deck. Early Bird from 4:30 until 6 p.m. (off season). Best Island Happy Hour from 4:30 until 8 p.m. featuring incredible drink and raw bar specials. Live music and dancing with Pete Carroll on Wednesdays, classic soft rock with David Wingo on Thursdays, and jazz with Earl Williams on Fridays. Tableside magic shows on Sundays and Mondays. Call (843) 785-4442 for reservations and information or online at www.kingfisherseafood.com. KURAMA JAPANESE SEAFOOD AND STEAK HOUSE & SUSHI BAR Located at 9 Palmetto Bay Road next to Sea Pines Circle, Kurama Japanese Restaurant offers a wide selection of beer, wine, cocktails as well as the finest Japanese sake. Only at Kurama can you take advantage of our Happy Hour specials and indulge yourself in authentic Japanese meals that will complement your choice of beverage. Open daily from 4:30 until 10 p.m. Call (843) 785-4955 or visit www.KuramaHHI.com for more details. ISLAND WINERY Tasting Room/Store Hours Mon thru Sat 12:30 to 5:30 pm Taste our award winning wines made on premise. bottle and a full bar all in a comfortable and casual setting. Specializing in great pizza and calzones, monumental hoagies and fresh salads. Plenty of TVs to view your favorite teams. Win prizes at live team trivia Wednesday nights (HHI) at 9 p.m. (Tuesday’s at 9 p.m. in Bluffton). Enjoy Karaoke on Saturday Night (HHI). Happy Hour from 3 until 6 p.m. everyday. Open daily from 11 a.m. Call (843) 686-2474 (HHI) or 706-0800 (B-Town). Enjoy 3 Wines and a cheese platter. Located at 95 Mathews Drive in Port Royal Plaza, Suite C. Contemporary Asian cuisine served in a magnificent atmosphere. Choose from Hibachi, Thai or Chinese or relax at the sushi bar or in the lounge. Open 7 days from 11:30 a.m. until 11:30 p.m., Sunday thru Thursday and 11:30 a.m. until midnight on Saturday and Sunday. Call (843) 341-3377 for more information or directions. Monday - Friday Enjoy light appetizers while sampling a variety of wines from our extensive wine list. Located in the Village at Wexford. Enjoy authentic classical Italian cuisine prepared daily by Chef Michael Cirafesi. Relax at the elegant, yet casual bar and enjoy a brilliant array of wines from every region in Italy. A large selection of Italian specialty cocktails, aperitifs, digestivos, homemade limoncello and grappa are also available. Open nightly from 4:30 until close. Call (843) 842-5505 or visit us online at www.ombrahhi.com. THE QUARTERDECK Head to Harbour Town’s legendary Quarterdeck for the island’s best sunsets, overlooking Calibogue Sound, and enjoy an extensive menu of beers, wines and specialty cocktails, as well as light evening fare and desserts. Live outdoor entertainment is offered seasonally. Call (843) 842-1999, or online at seapines.com/dining. REDFISH On the corner of Palmetto Bay Rd. and Archer Rd. Our unique bar and retail wine shop offers a contemporary, yet casual atmosphere for the wine connisuer. Over 1,000 hand-selected wines from all over the world are available as well as a full bar selection. The wine shop is open Monday thru Saturday at 10 a.m. Dinner is available daily from 5 to 10 p.m. Call (843) 686-3388. REILLEY’S Located in Reilley’s Plaza just off Sea Pines Circle and Port Royal Plaza. An Island Tradition since 1982. Happy Hour from 4 until 7 p.m. featuring 50% off on selected liquor, wine and beer plus great appetizer specials. Also, occasional live entertainment (call for schedule). Full menu and bar available inside or outside on the newly renovated patio. Open daily from 11:30 a.m. Call (843) 842-4414 or 681-4153 or online at www.reilleyshiltonhead.com. SAN MIGUEL’S MEXICAN CAFE Located at Harbourside III on Shelter Cove Harbour. Do Mexican on the marina while enjoying the Island’s best margaritas. The outdoor bar overlooking the marina is a favorite of locals and visitors alike. Great happy hour from 4 to 6 p.m., seasonal live entertainment and panoramic views make this a must stop. Open daily from 11:30 a.m. Call (843) 842-4555. SANTA FE CAFÉ Located at 807 William Hilton Parkway near the entrance to Palmetto Dunes. Capturing the spirit of New Mexico in an elegant yet casual, cozy atmosphere. Our outdoor rooftop cantina is the perfect setting for one of our famous margaritas, sangrias or an imported beer. Enjoy Happy Hour daily from 5 until 7 p.m. and live entertainment Wednesday thru Saturday and first Sunday of every month. Open Daily for dinner from 5 p.m., and lunch Monday thru Friday from 11:30 a.m. until 2 p.m. Call (843) 785-3838 or www.santafehhi.com. STEAMER SEAFOOD Located on the pond in Coligny Plaza. Fresh seafood, amazing appetizers, raw bar delicacies all served with a wide variety of beverages. Over 300 beers from around the world, fresh homemade frozen drinks, pitchers of cocktails and wine by the glass or bottle. Celebrating 23 years on the Island. Seasonal live entertainment featuring Todd Cowart. Open from 11:30 a.m until late, 7 days a week. Call (843) 785-2070. TOPSIDE WATERFRONT RESTAURANT Enjoy a fabulous dinner, wonderful wines, signature cocktails and delicious desserts at Topside, amidst incredible sunset views, then head to the iconic Quarterdeck, just steps away, for live outdoor entertainment (offered seasonally.) Call (843) 842-1999, or online at seapines.com/dining. HILTON HEAD ICE CREAM Located at 55 New Orleans Road, just off Pope Avenue. Hilton Head Ice Cream has received accolades from CNN, Warner Books, Southern Living magazine and voted best of Hilton Head in local media polls. Even the U.S. Ambassador to Great Britain has touted Hilton Head Ice Cream. The shop has created many flavors: Girl Scout Cookie, Flower Power, Mocha Pecan, Bananaâ&#x20AC;&#x2122;s Foster and Espresso. Salt air is our secret ingredient and there is love in each batch too. Call (843) 842-6333 or www.hiltonheadicecreamshop.com. THE ICE CREAM CONE An island tradition since 1971 serving the most scrumptious selection of premium ice cream, soft serve frozen yogurts, shakes, malts, floats and sundaes. A wide array of flavors and toppings make it easy to create your special treat or try one of our new novelites. Open daily from 11 a.m. until 11 p.m. Follow the herd...to The Ice Cream Cone in Coligny Plaza next to Coligny Hardware. Call (843) 785-4440.
anywhere. Offering16 flavors of fudge made fresh daily, 8 flavors of saltwater taffy and a large variety of hand dipped chocolates sure to please even the sweetest tooth. Gift baskets and shipping available. Locally owned and operated. Senior citizens receive a 10% off discount. Call (843) 8424280 for more information or check us out online at www.islandfudge.com. ISLAND WINERY Located at 12A Cardinal Rd. Island Winery presents a unique concept in fine wines, traveling the worldâ&#x20AC;&#x2122;s vineyards to select the perfect grapes and handcrafting their wines in small batches right on Hilton Head. Also featuring Lowcountry specialty wines with unique recipes made from local fruit. Enjoy tastings Monday thru Saturday, from 12:30 to 5:30 p.m., wine and cheese happy hour each Monday thru Friday from 4 to 5:30 p.m. and flights of wine and cheese Monday thru Saturday 12:30 to 2:30 p.m. Call (843) 842-3141 for directions and information or online at www.islandwinery.com. PIGGLY WIGGLY Located at 1 North Forest Beach in Coligny Plaza, near the beach. A full service grocery offering fresh seafood, full deli, beach accessories, beer, wine and our famous Piggly Wiggly T-shirts. Locally owned and operated for over forty years. Call (843) 785-3881 or online at www.pigglywigglycoligny.com. SEA PINES CATERING & WEDDINGS Hilton Head’s premier caterer offers award-winning service and cuisine, as well as incredible golf course, clubhouse, marina and beach venues, and can expertly accommodate groups of 2 to 500 guests. Special Events, Special Places, Special Memories. (843) 842-1495, seapines.com/meetings. SNO CONES BY CHRIS Located in Palmetto Bay Marina right across from Palmetto Bay Watersports at 114 Helmsman Way. Chill out at the coolest place on Hilton Head. Come in and enjoy a delicious sno cone treat…with over 25 flavors to pick from…the flavor combinations are endless! Be sure to try one with our new marshmallow or caramel toppings too! See the island’s largest and only exhibit of world famous icons made entirely out of Legos! Open Everyday from 1-8 pm. (843) 683-0592. RITA’S ITALIAN ICE Celebrating our 21st year on Hilton Head. Featuring real soft serve custard and Italian Ices made fresh daily on premise with real fruit. Cool off with Rita’s Famous Gelati, an amazing combination of Italian Ice and Frozen Custard layered to perfection. If it’s just old-fashioned Frozen Custard you want, we have Vanilla, Chocolate or Twist available on a cone, in a shake, in a sundae or our Blendini. And you can’t beat the heat better that with our frozen Lemonades. Located Oceanside at Coligny Plaza. Call (843) 341-5587. TOBACCO ROAD Located at 119 Arrow Road, Suite B. An impressive array of cigars, perfect humidification and a well trained staff will meet all your needs. Hilton Head’s oldest smoke shop has catered to locals and tourists alike for over ten years. Offering a complete selection of fine cigars, domestic and imported cigarettes, and a comfortable smoking lounge in which to enjoy them. Open Monday thru Friday from 10 a.m. until 6 p.m. and Saturday from 10 a.m. until 3 p.m. Call (843) 341-6265 or online at www.hiltonheadcigars.com. YELLOW CAB The largest cab fleet on Hilton Head. All vehicles are radio dispatched, late model sedans or mini-vans. Serving all area airports. Service 7 days a week, 24 hours a day. Providing great service and comfortable air-conditioned transportation. Call (843) 686-6666. A TASTE OF ADVERTISERS / MAP LOCATION 1. 2. 3.